JPMorgan Chase reported better-than-expected first quarter profits Friday, despite what the bank described as soft loan growth. Investors weren't pleased with the results though. Shares of the bank were trading lower. Why was the market not impressed? If you dig deeper into the bank's profits, you'll find that $1.15 billion of the bank's $6.5 billion in net income came from releasing funds set aside to offset potential losses from faulty mortgage and credit card loans. Investors typically don't like those types of profits since they are not a true indication of demand for the bank's services. In JPMorgan's case these so-called reserve releases could continue to shore up profits for the next year or so, said RBC analyst Gerard Cassidy. After this billion dollar plus release, JPMorgan still holds $22 billion in reserves. Cassidy estimates that the bank might only ultimately need $15 billion. On a per share basis, the bank posted a profit of $1.59. That topped analysts' forecasts of $1.40. But the bank's revenues of $25.8 billion narrowly missed expectations of $25.9 billion. Economy improving, but small businesses worried: CEO Jamie Dimon said that overall he was optimistic. "We are seeing positive signs that the economy is healthy and getting stronger," Dimon said in a release. But Dimon also noted that there are challenges. He said in the release that small businesses remain "cautious about the recovery and fiscal uncertainty, and are not investing their capital." JPMorgan's executives said despite a slow loan growth environment in the first quarter, they are already seeing signs that next quarter could be stronger. RBC's Cassidy said the second quarter will "really tell the tale of whether the loan growth slowdown is something we have to be concerned about." There are signs that JPMorgan and other big banks will struggle to continue generating strong profits from home loans. Mortgage banking earnings decreased by 31% compared to the first quarter of 2012. Revenues and profits in the consumer and business banking segment were also down from a year ago. During a call with analysts in January, Dimon had predicted that mortgage results would bounce around for several quarters. One bright spot: Investment banking. Revenues in the segment increased by 9% and profits rose by 28%, largely driven by the underwriting of corporate bond offerings and a sharp uptick in bond and equity trading revenue. 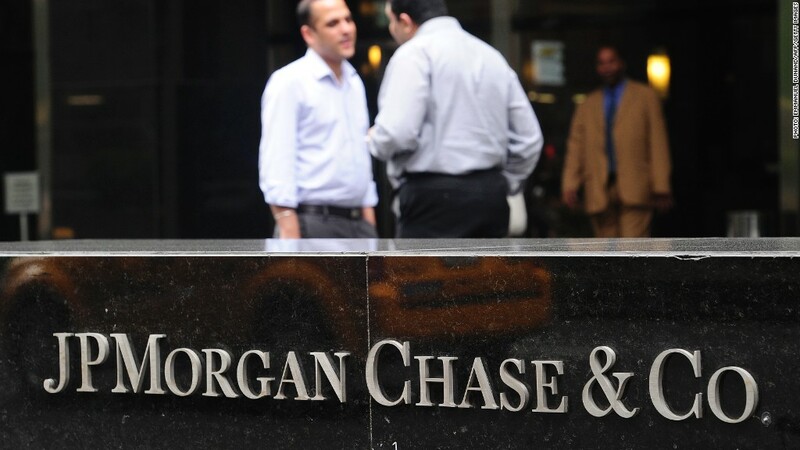 Following the London Whale trading fiasco that has resulted in at least $5.8 billion in losses, JPMorgan has been under increased scrutiny from Washington. Dimon reiterated during a conference call with analysts Friday that the bank's "top priority" is to make JPMorgan safer and comply with new banking regulations. He outlined this commitment in a letter released to shareholders earlier this week. Dimon said the banking system has become safer and stronger since the financial crisis. "Certain activities that people didn't like are no longer being done," said Dimon. Dimon on the defensive: Still, Dimon couldn't resist taking some jabs at regulators and lawmakers. He called on Washington to figure out when enough regulation is enough. "I hope at one point we declare a victory and stop eating our young," said Dimon. Dimon has also come under fire from some of his own investors. A shareholder proposal to separate the roles of chairman and CEO at JPMorgan will be voted on at the bank's annual meeting on May 22. Dimon, who currently holds both titles, said Friday it is ultimately for the bank's board of directors to decide whether the bank needs to split the positions. Another new area of focus and cost: cybersecurity. Dimon said JPMorgan will spend $200 million this year to protect the bank against cyberattacks. "It's a big deal," Dimon said on another call with reporters. Bank stocks have been on a tear this year following a hot 2012, which sets a high bar for bank earnings season. JPMorgan's shares are up 12% in 2013. JPMorgan (JPM) and Wells Fargo (WFC), which also released results Friday, are the first banks to report earnings. Wells Fargo's earnings also beat forecasts. But like JPMorgan, Wells Fargo's revenues were below estimates. Shares of Wells Fargo fell 2%. Goldman Sachs (GS), Bank of America (BAC), Morgan Stanley (AACXX) and Citigroup (C) are set to report next week.